Once upon a time, a sailor with a speech impediment and overdeveloped forearms convinced a generation of kids to eat their spinach. Eating spinach, he told us would make us stronger, faster and give us the ability to save our loved ones from evil… or at least big, ugly bearded guys. While Popeye was not my favorite childhood cartoon hero, I shared and still share his enthusiasm for this iron-rich, leafy vegetable. As a kid, like so many others, I hated eating veggies. Spinach was one of the few exceptions. 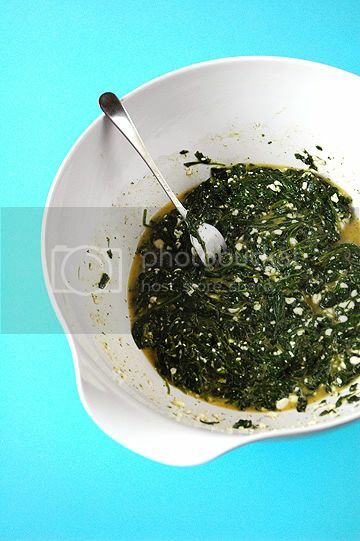 Unlike other greens, which I would only eat if disguised in rich creamy sauces or dressed in meat, I enjoyed the taste of spinach ‘au naturel’. As I’ve gotten older, I’ve continued to enjoy spinach in a variety of styles. I’ve previously written about my love for creamed spinach, one of if not my favorite way of preparing my favorite vegetable. 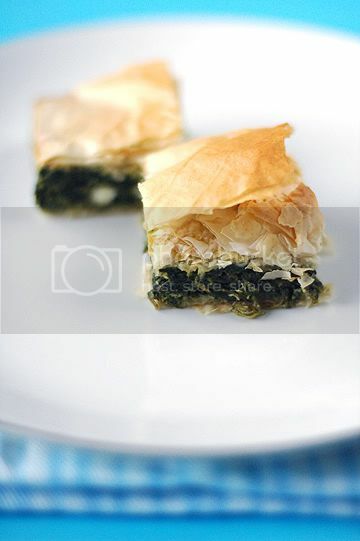 Another favorite spinach recipe is spanakopita, a Greek spinach pie made with phyllo pastry. I used to order it religiously at a Greek restaurant around the corner from my university. This rich combination of feta and spinach coupled with crispy, fluffy phyllo is, when done well, simply delicious. Unfortunately, it’s hard to get good Greek food in Singapore and until recently I’d gone years without sinking my teeth into a good spanakopita. On my recent trip to Vienna, however, I had a fantastic one. My colleague had dragged me into a tiny Greek restaurant around the corner from Karlsplatz for lunch. While she wolfed down what looked like a great slice of moussaka, I happily consumed an outstanding portion of spanakopita. It was so good in fact that I’ve been inspired to make my own. After looking at several different recipes in a number of cookbooks, I decided to try the one in Claudia Roden’s The New Book of Middle Eastern Food. From what I read, it looked relatively easy. And it was, until I got to the step that involved separating the thawed phyllo sheets and layering them onto my baking tray. It was my first time using phyllo and while I’d watched others (like my darling wife S) use it, I’d never tried it myself. Many of the thawed phyllo sheets were stuck together and when I tried separating them, they broke apart. After a little patience and a lot of help from S (my savior! ), I managed to put the pie together properly. Baking gods be praised… it came out well. I’d even say it was above-average. One of the two friends that we fed it to liked it enough to eat his way through half of the whole tray. For my tastes though, I think it needed a little more cheese and maybe some different kinds of cheeses. The pie tasted, well, healthy. Good, but healthy. Preheat the oven to 350ºF/180ºF. Wash the spinach, drain and then steam the spinach until soft. Press and drain off any excess water. Then put the leaves in a pan and cook over high heat, drying out the spinach. Mash the cheeses together with a fork. Add the egss, spinach, dill, and nutmeg. Salt and pepper to taste. Find a baking tray or pan a little smaller than the sheets of pyllo. Brush it with the oil. Place half of the phyllo sheets, one on top of the other, at the bottom of the pan, brushing each sheet with the oil, letting the sheets come up along the sides. Spread the spinach mix evenly on top. Then cover with the remaining sheets, brushing each, including the top one, with the oil. With a sharp-pointed knife, cut 2-inch diamonds with parallel lines into the pie, only down to the filling, not right through. Bake for 30-45 minutes, or until crisp and golden. Cut along the cutting lines, this time right to the bottom, and serve hot. Please take part in the 1st Annual Asia Pacific Best Restaurants List. Help vote on what you feel are the very best restaurants in Asia, Australia and the Pacific Islands. For info, click on the logo above. I’m so very tempted to try. Could you share where you buy your phyllo pastry from? Everything else looks like can be bought from the supermarket. By the way, what oven do you use for your pie? I made this exact same thing on Friday for dinner! In fact, I have leftovers for lunch today. I wanted to fool around with the recipe a bit and add some parsley but the boy was against it. I love Roden’s book. You should try the megaderra with lots of onions and yogurt. It’s a staple at my house. yum, how can I not fall in love with such recipe and pictures! I am SO much going to try this! Beautiful! you look busy this time of the year. Can I still vote next week? 🙂 I’ll be back! We bought our phyllo at Market Place, Tanglin Mall. They have a wide selection. The pictures look sooo tempting. I make this all the time, only the Turkish version, the frsher the dough, the better the taste. The only difference I’ve seen to yours is I use much more of feta cheese (and the spinach is first sauted with thinly sliced onions) in the filling and no eggs or dill, and pour down a mixture of milk, olive oil and eggs – so that it’s really moist in layers but crispy on top. I’d be happy to share the recipe if you’re interested in another twist. Reading your blog is a pleasure. I saw this recipe a few days ago and decided to try it last night. It was absolutely delicious. I don’t think I’ve ever enjoyed spinach so much in my life! Thanks for yet another amazing recipe. This recipe is very close to our family Spanakopita recipe. A few years ago my mom dropped the cottage cheese, and replaced it with more feta. It is the best. Maybe you’ll try it! You can usually find phyllo in most large grocery stores in the frozen foods section. One thing my wife and I discovered after many times making both spinokopeta (sp?) and baklava is that allowing the dough to defrost in the refrigerator overnight works much better than thawing it on the counter–there tends to be fewer problems with the sheets sticking together. I should have added to my previous post that it is much easier to do with two people–one separating the sheets and handing them to the other who layers and butters them. Working quickly helps keep the sheets from drying out (which happens very quickly). Also, the recipe my wife uses does not have nutmeg or parsley but uses oregano instead. It gives it a subtler flavor and I like it better. I have a different recipe passed down through generations of my Greek family. 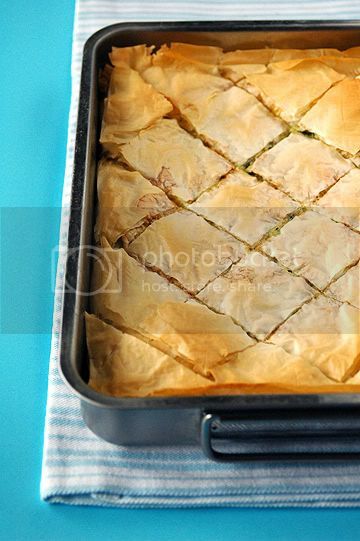 We always used melted butter between the layers of phyllo instead of oil! Sooo yummi…try it. awesome idea! I have never thought to make spniache pie with puff pastry! made this tonight for a supper party & it came out great. I did add some butter and green onions.